What an amazing time our children had at the Borough Gymnastics Festival. Our Years 3 & 4 team came home in second place overall and one of our students was placed first as an individual. Our Years 4 & 5 intermediates came seventh out of 17 schools. 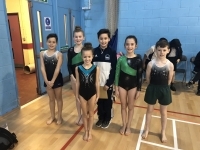 This was the first time some of them were in a gymnastics competition, so well done. Three of our advanced gymnastics came in with the highest scores for their floor routines. You were all amazing, thank you for all your hard work.